Building on a series of solid entries in the Marvel Cinematic Universe, Captain America: Civil War brings The Avengers to a new and more personal crisis point. In the wake of the events of The Avengers: Age of Ultron, the world has had enough of rampant destruction unleashed by those with mutant superpowers. The United Nations has taken action and decided that The Avengers must sign the Sokovia Accords, which places their activities under U.N. direction and control, or else retire for good. 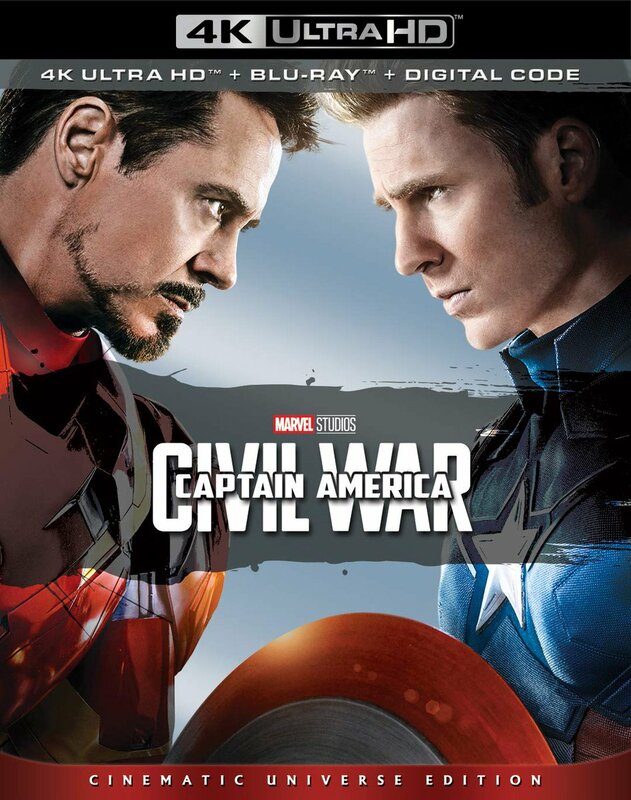 This divides members of the team between Tony Stark (aka Iron Man – played by Robert Downey, Jr.), who feels that The Avengers have indeed caused too much collateral damage, and Steve Rogers (aka Captain America – Chris Evans), who agrees but is afraid that future U.N. leaders might try to use The Avengers to serve their own personal and political agendas. Into this mix comes Helmut Zemo, who seems intent on reviving the old Soviet weapons program that created the Winter Soldier (aka Bucky Barnes). When events cause Barnes to emerge from hiding, Steve quickly moves to help his old friend – after refusing to sign the Accords – which deepens the rift between Steve and Tony… and soon sets Avenger against Avenger. Based loosely on Marvel’s 2006 Civil War comic book series, Captain America: Civil War succeeds in no small part because Disney and Marvel (unlike their counterparts over at Warner and DC) have had the patience to develop all of these characters gradually over many films. The simple truth is, most superhero films eventually devolve into people in different colored tights fighting each other with different colored superpowers, thus causing peril and destruction to those around them. But this film works because the relationships between these characters are fully rendered and because you actually care about them. It also helps that the rift between Tony and Steve is complicated – this isn’t simply black or white, right or wrong. Both sides have valid arguments here – there’s nothing but shades of gray. The various Avengers take the positions they do reluctantly and because they’re trying to stay true to their own principles. That’s far more nuance than you typically find in a film like this. It also helps that the screenplay is smart, and that directors Anthony and Joe Russo know exactly what they’re doing. They keep the story moving deftly along, maneuvering all of the various pieces into place with confidence, and they know how to direct a good action scene. Each of The Avengers gets their moment to shine here (as do many of the supporting characters), not just in the fury of battle but in quieter personal moments too. There are also several good laughs in this film and some nice surprises, including the long-awaited appearance of the new young Spider-Man (Tom Holland), as well as the inclusion of Ant Man (Paul Rudd) and The Black Panther (Chadwick Boseman). Disney’s Blu-ray edition presents the film in 1080p HD in its original 2.39:1 theatrical aspect ratio. Image clarity is excellent, with rich and natural (if digitally specific) coloring, excellent contrast, and nicely deep shadows. There’s also lovely texture visible and particularly nice fine detailing. Video-wise, the Captain America: Civil War Blu-ray is a great presentation. The film’s audio is available in English 7.1 DTS-HD MA, as well as English 2.0 Descriptive Audio, and French and Spanish 5.1 Dolby Digital. It’s a little surprising that there isn’t an Atmos or DTS:X track here, but the 7.1 mix is near to reference quality, if not quite at the very top level of such mixes. Staging is smooth, natural, and lively; big and wide up front, with excellent directional effects and panning. The mix occasionally lacks a little bit of the low end foundation you might be wanting, but dialogue is always clean and clear, and there’s excellent dynamic range. Optional subtitles are available in English, English SDH, French, and Spanish for those who need them. In terms of bonus features, the regular Blu-ray starts with a feature-length audio commentary with Anthony and Joe Russo, as well as screenwriters Christopher Markus and Stephen McFeely. It’s well worth a listen if you’re a fan of the film, as the participants offer lots of little MCU and character insights, as well as backstory and other information. Next up is the United We Stand, Divided We Fall – The Making of Captain America: Civil War – Part 1 (HD – 22:25) and Part 2 (HD – 23:18) documentary. It’s not particularly comprehensive, but it does touch upon some interesting issues and challenges in the making of this film. There are 4 deleted and extended scenes (Extended Peggy’s Funeral, Zemo Meets Doctor Broussard, “You Are Not Used to the Truth”, and “Gotta Get Me One of Those” – HD – 7:52 in all), plus a Gag Reel (HD – 2:53). Finally, you get sneak previews for Dr. Strange, an Audi car promo, and a spot for the Marvel Contest of Champions mobile game app. This particular package also includes a Blu-ray 3D version of the film and it’s actually one of the better examples of the format you’ll see of late. The 3D image offers terrific depth and precision, nice clarity, and a natural sense of staging and dimensionality. Colors look a little bit subdued, as they always do through 3D glasses, and when the action really gets going the frame rate tends to struggle a bit to keep up. But it helps that most of that action takes place in daylight. The Blu-ray 3D version also features the theatrical IMAX sequence in full 1.78:1 – a welcome touch. On the whole, this a very nice Blu-ray 3D presentation. Note that you also get a Digital Copy code on a sealed insert in the packaging (that’s shaped like Cap’s shield – a nice touch). The best comic books work because of the intangible analog quality of art and storytelling in that medium – the magic of ink and words on the page, as provided by the artist and writer. But in an era when literally anything that can be imagined is realized in digital CG and shown on screen, usually in excessive detail, the best comic book films work instead because of the humanity and depth of the characters, and the careful balance of character to action. Captain America: Civil War succeeds on both counts, and that’s to the credit of all involved. This is an exceedingly fun cinematic roller coaster ride. Like most such coasters, you might not think about it a lot after you step off… but you’ll enjoy the hell out of it while you’re strapped in, pulling Gs with the wind whipping through your hair. Given this year’s many disappointments in the genre, we’ll just call that a win.